All Other Metro Phoenix Cities! Looking for a great Phoenix Tutor? From elementary all the way up to college and graduate school, our experienced team at Grade Potential ensures that you’ll receive the highest quality tutoring on your way to achieving your goals, all at an affordable price! We've worked with thousands of local students, so we know what it takes to be successful around here. 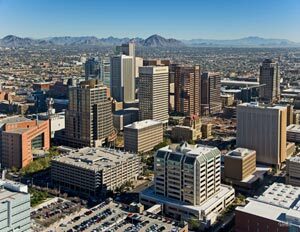 Not only is Phoenix the largest city in Arizona, it is also the capital city, making it quite the destination for tourists. Besides tourism, Phoenix is also a great place to call home, as it boasts a very high quality of life for its residents. The large metropolitan area that surrounds Phoenix provides all of its residents with a vast array of amenities. With stunning natural beauty that is so unique to this region of the United States, Phoenix is a big city with a lot to offer. Before any white settlers came to this area, the region that is now considered Phoenix was once inhabited by Native American peoples. A few of the tribes that lived here were the Hohokam, the Anasazi, Mogollon, Mesoamerican, and Singua peoples, and all of these distinct cultures are part of what makes Phoenix’s heritage so unique. It wasn’t until the middle of the 19th century that the city of Phoenix was settled by white settlers that were traveling west in search of new land. At that time, Phoenix primarily consisted of large farms and agricultural settlements. You might be wondering why this area would be so popular for farming, since the climate of the area is so harsh and desert-like. Because of the location of local rivers, irrigation has always been available in Phoenix, and as a result, farming is still a major industry in the community to this day. After World War II, there was a lot of change throughout the United States, and Phoenix was no exception. Where agriculture had been the primary source of income in the area now technology industries were popping up. At this same time, air conditioning was becoming a popular addition to new homes, which of course was a relief for residents of Phoenix. Surviving the hot summers became much more manageable. Families that live in Phoenix have many reasons to love this city. Local parks and recreational facilities are all well maintained, and the access to beautiful nature trails throughout the city make this an ideal place to live for people who love the great outdoors. When it comes to education, local students have access to many high quality public schools, as well as several high quality private schools and charter schools as well. Parents appreciate having so many great options for their children. For students that need extra help, local Phoenix tutors are available. One-on-one meetings with these tutors can help students reach their own individual educational goals. Grade Potential Tutoring is proud to provide Phoenix students with the opportunity to win a semi-annual college scholarship of $1,000! We are proud to assist students with their investment in education. Many local families trust us with their educational investment on a regular basis, so we feel great about giving back in a similar way! Click below to learn more about our scholarship program and how to apply.